I had heard of Limes via the Restaurants Brighton website, and I had always intended to go and check it out. Sometimes it’s nice to get out of Brighton for a change and visit another area, and Lindfield’s high street is very pretty, with little shops and pubs and lined with trees. 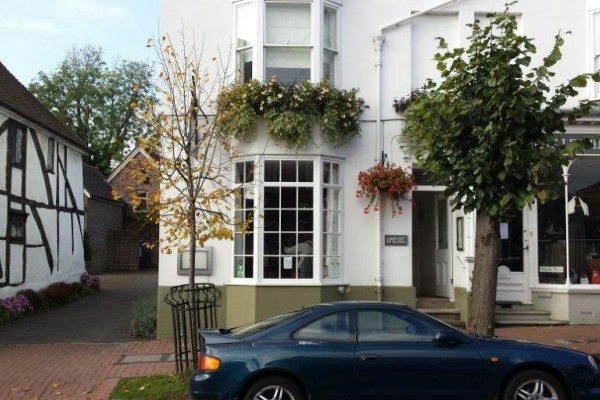 Limes is a friendly local restaurant serving high quality British food and offering stylish apartment style accommodation above. Every second Thursday of the month they hold a feasting evening with everything on the menu being vegan and gluten free. Their head chef, Patcharee, originates from Thailand, so the food is Thai influenced, bringing fresh and vibrant flavours to 11 different dishes. I invited my friend who is vegetarian and inspires to eat vegan where possible, and as I am gluten intolerant we were a perfect match. We both live in Brighton so we took the train to Haywards Heath followed by a taxi to Lindfield which takes around 10 minutes from the station. It looks like a beautiful area and I would like to head back there in the day time one weekend for sure. We headed inside and were greeted on arrival. There were a few keen diners there already, who had been served some colourful looking appetisers which I couldn’t wait to try. Once seated, we were given the menu for the evening and the wines list that they were going to be matching with each course. There are four different course groups on the menu – Appetisers, starters, mains and desserts, and a total of eleven different dishes altogether. We were pleased that we came hungry that night! Each course is then matched with a small taster of wine they recommend, which you can then purchase more of, ranging from 125ml to a bottle. All of the wines are vegan and selected by their friends at Southdown Cellars. 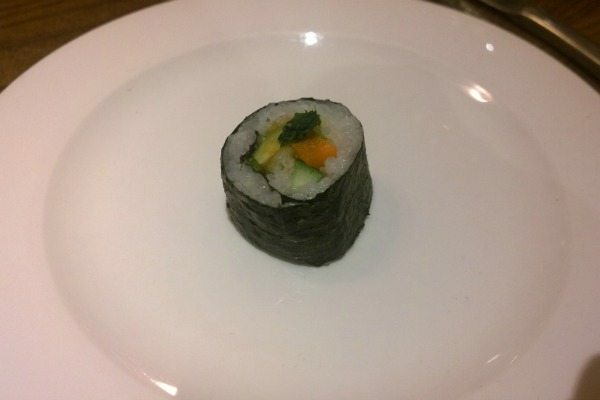 Immediately we were brought the first appetiser – hand made sushi filled with avocado, cucumber and carrot. The sushi rice was well seasoned, perfect amount of stickiness and the seaweed was moist and not all dry. A good start to the night. Their sommelier for the evening came over to introduce us to our first wine of the evening which they have carefully picked to match with all of the appetisers on the menu. This was called Pierre et Papa – a dry white wine from South West France. He explained a little bit about the history of the wine and why it was chosen, and the menu that we were given was also extremely detailed and very helpful to read while drinking. This wine was light and fresh and I could definitely taste peaches! The next couple of appetisers made the rounds – orange segment with caramelised peanuts, tamarind and palm sugar, followed by betal leaf topped with cashew nuts, dried coconut, lime, chilli, palm sugar and tamarind sauce. I have spent a lot of time travelling through Thailand and South East Asia, and these are the types of flavours and ingredients I love when travelling – fresh, exciting, and different combinations that make your taste buds sing. It was refreshing to be eating this in a little town in East Sussex and my friend and I found ourselves talking about our travels all evening! You know food is good when it brings a touch of nostalgia to the table. They were a great canapé size which we popped in our mouth and led to a burst of flavour. The orange with the peanuts had the perfect balance of sweet, sour, spice, crunch and acidity. 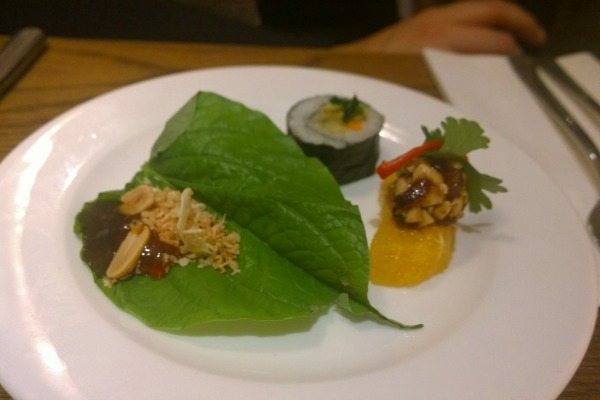 The betal leaf has it’s own unique flavour, and again was extremely balanced with texture and taste. The waiting staff kept bringing them round to the tables, and I couldn’t stop eating them! We were mindful too as we knew we had so much more food coming. 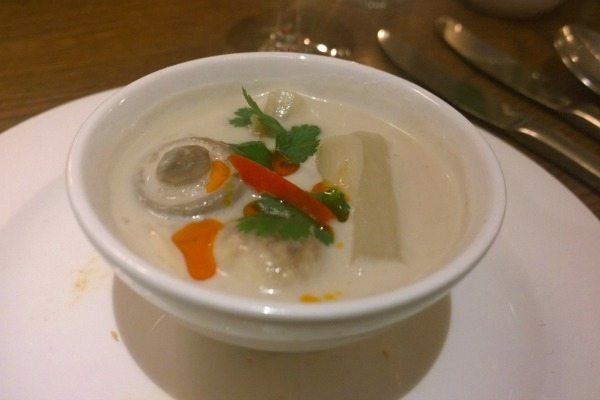 Once the last of the appetisers were brought around and we had finished our wine tasters, the first of our starters arrived – Tom Kha soup. 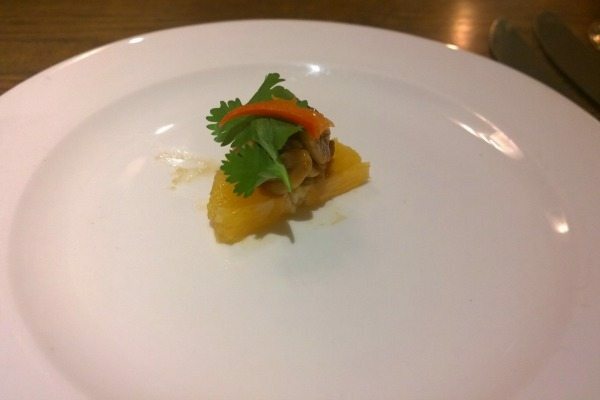 This was served with mushrooms, coriander, salsify and galangal, in a slightly spicy coconut broth. Tom Kha is one of my top choices when ordering Thai and this didn’t disappoint. The soup was packed with lemongrass and other Thai spices, the coconut milk was creamy, and the vegetables inside were cooked to perfection. There were little flecks of micro coriander which were tasty. The staff bought round another bowl if we wanted it, and we both greedily accepted as it was so good! The next starters came served together on a plate and looked very inviting. We had Kanom Krok – a Thai pancake topped with taro, sweetcorn and spring onion and a deep fried Vietnamese spring roll filled with wood eared mushrooms and a hoison sauce. The Kanom krok immediately took me back to the streets of Thailand, as the pancake had the same familiar flavour I remember. The taro was sweet and married well with the sweetcorn topping. It was completely different to what I was expecting but my friend and I both loved it! 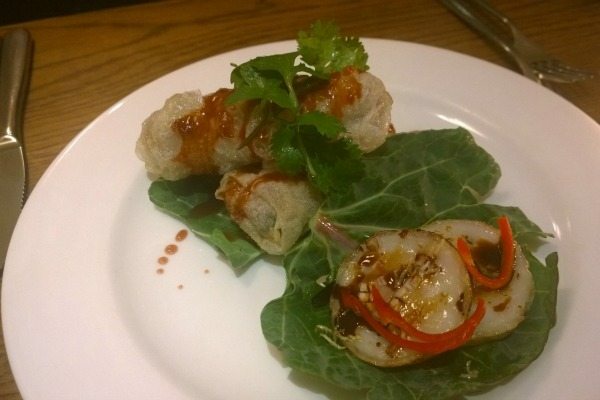 The spring roll was made with rice flour so the outer layer was thin and crispy. 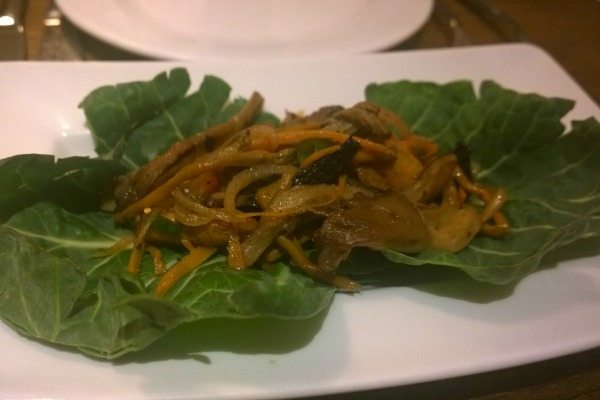 The wood ear mushrooms provided earthiness and protein to the filling, and there was a good balance of texture with the bean sprouts, rice noodles, cabbage and carrots. I would’ve immediately assumed a white wine to be matched to these dishes, however Limes had blown our taste buds again with a Cotes Du Rhone from France. The wine was strong and well rounded, and cut through the dishes well. This is one which we ordered another glass each of as we found it delicious! 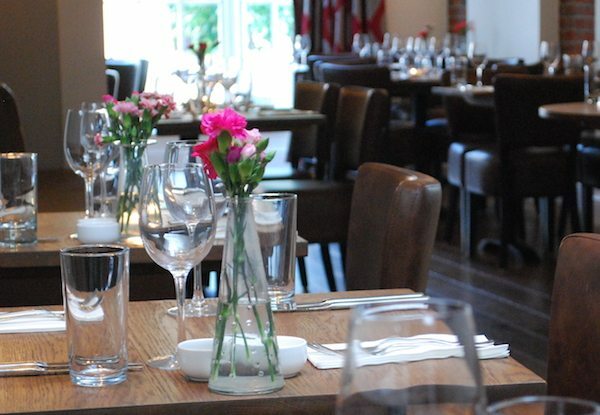 The atmosphere in the restaurant had positively lifted, the staff were happy and buzzing and the service was fantastic. My friend was loving all of the food too so I was very pleased! We were also still sharing our Asia travel stories, and talking about all of the places that we still want to visit. 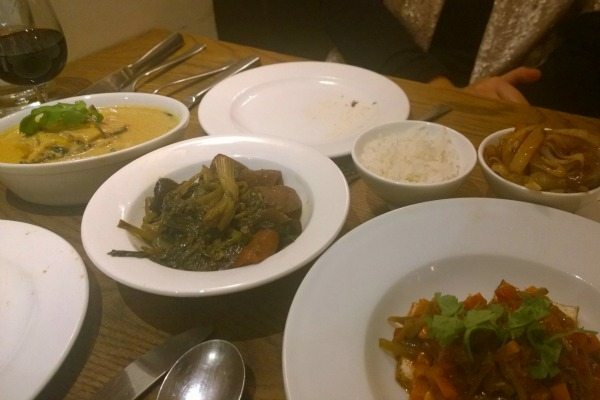 Our plates were cleared and the mains started arriving, Earlier in the evening we were asked if we would prefer rice or noodles to accompany our main dishes and we decided to go with one of each so we could try them out. The mains included Mushroom Larb, Sweet and Sour Tofu, Jungle Curry and a Slow Cooked Daikon Stew. Larb is a dish that originates from many places in South East Asia, with each country serving them slightly different. The larb I have had before is made with minced meat, herbs, toasted rice, fish sauce and lime, then served in a bowl of lettuce, so I was looking forward to try the vegetarian version. Once again, Limes didn’t disappoint. It was packed with mixed mushrooms, herbs and spices and had lots of flavours and was incredibly more-ish. This would be a great mid week meal or lunch at work as it was also very filling on it’s own. The next dish was the fried tofu with sweet and sour sauce that had the perfect balance of sweet and sour and the sauce was not too much it was just right. A favourite main of mine was the slow cooked daikon stew and certainly something I will be trying at home! Daikon is a root vegetable usually shredded and served fresh with sushi but, when slow cooked, it holds its shape but just melts in the mouth and is still fresh but sweet. It was absolutely delicious and something that my friend had never tried before but, just like me, will be having it again. 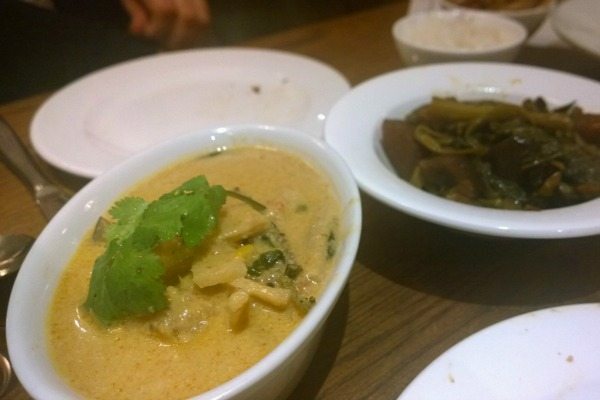 I have had jungle curry a couple of times and everywhere I have it is is made differently. I think what I have read the jungle curry is a Northern dish made from the jungles in North Thailand and does tend to vary place to place depending on the ingredients available. Most versions aren’t served with coconut milk as these are not common in the Northern Thailand highlands, however Limes version was and was lovely and peppery with aubergine, peppercorns, sweetcorn and snow peas. The coconut milk provided a cooling element to the dish so it wasn’t too spicy. The wine we were served with our mains was an organic Torrones from Mendoza, Argentina – again something that I would never think of but it worked! It had a slight oakiness and very pleasant to drink and cooled down any spiciness too. Last but definitely not least we were bought our dessert. We had struggled through the mains as we weren’t able to refrain from eating seconds in the first two courses but my friend is Dutch and loves sweets, and I couldn’t resist when I knew what we were getting. 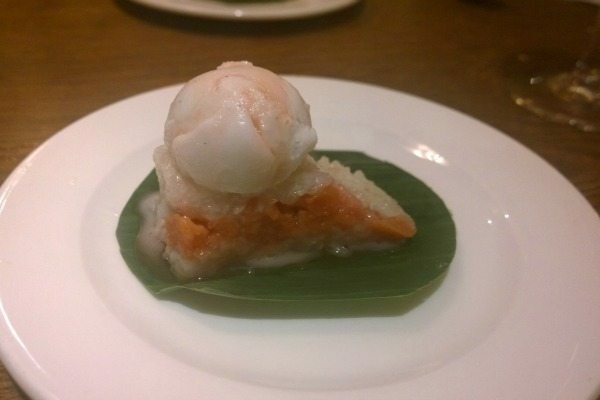 The dessert was sticky rice topped with coconut milk, quince and coconut sorbet sitting atop a banana leaf. The sticky rice was still warm and it reminded me of a comforting rice pudding, but the sorbet cooled it all down and added a freshness to make it still light and delicious. What a gorgeous end to the meal. The wine to match was a sweet, late harvest Chenin Blanc which tasted of peach and melon and was a little too easy to drink. We also ordered another glass of this as we couldn’t resist! 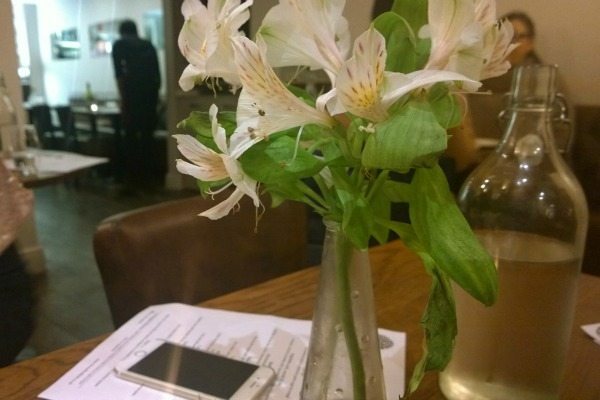 What a beautiful evening we had at Limes, it was so nice to do something different and I would love to go back again. The price is only £35pp which is an absolute steal, combined with an off peak train and short taxi ride it is definitely something I would recommend. Not just for my vegetarian and vegan friends, but for anyone who loves good quality Asian food, top quality wines and appreciates proper service. Make sure you book early to avoid disappointment! Meat lovers you will be surprised.